Even though Internet radio may not be as popular with the masses as terrestrial radio, the amount of programming that you can find makes jumping through hoops just to listen it worth it. That said, sitting in front of your computer all day just to listen to the latest episode of "Gregg and Tony" is kind of a drag. That's where the Scitec IR-001W comes in. 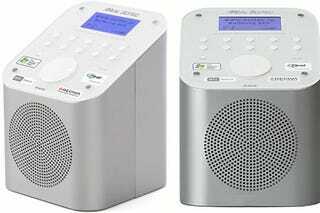 It's an Internet radio that sits on your wireless LAN and plays MP3, WMA, AAC and RealMedia files, which should cover just about every type of Internet radio broadcast, including most of those lovable podcasts. Based on Reciva technology, the IR-001W can group radio stations based on geography, genre, name as well as your favorites. So if you just need to hear your European crochet radio, Scitec's got you covered. The radio is compatible with the WEP and WPA security protocols, so you don't have to remove your wireless LAN's security in order to listen. As for sound quality, the IR-001W only features a monaural amplifier, but does include a stereo output jack. So if you want, you can hook it up to your existing sound system and listen to higher quality sound, depending on the radio program, of course. It's coming out in Japan on July 12 and will retail for about $261.